Eighteen months ago I could confidently tell you that the last card game I’d remotely dabbled in was Exploding Kittens. As in, I’ve played it a handful of times at parties. Since then Shadespire knocked me flat, Lightseekers crept into my repertoire, now I land at another junction. PlayFusion, the guys and gals behind Lightseekers, have bagged the Warhammer Age of Sigmar license. 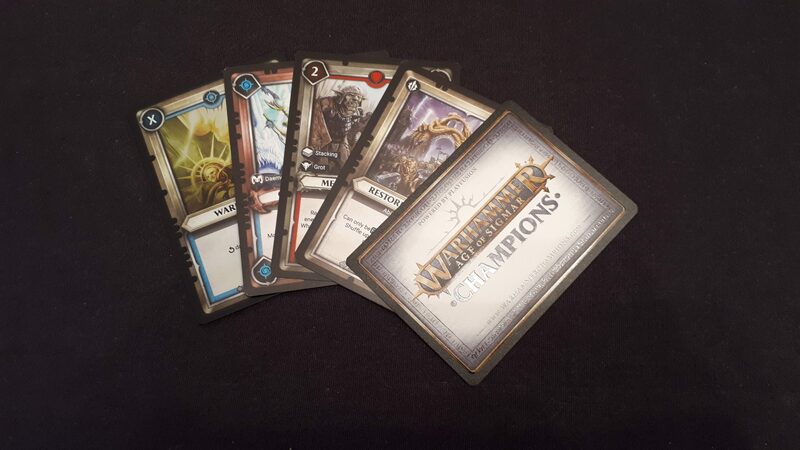 With it they have summoned a new card game they have dubbed Warhammer: Champions. We’re here to deliver our findings on this new venture. We’ve dabbled in Champions after giving it a spin at a few shows here and there. Their wrangling of the license was enough to entice me and lead me astray further down the CCG path. 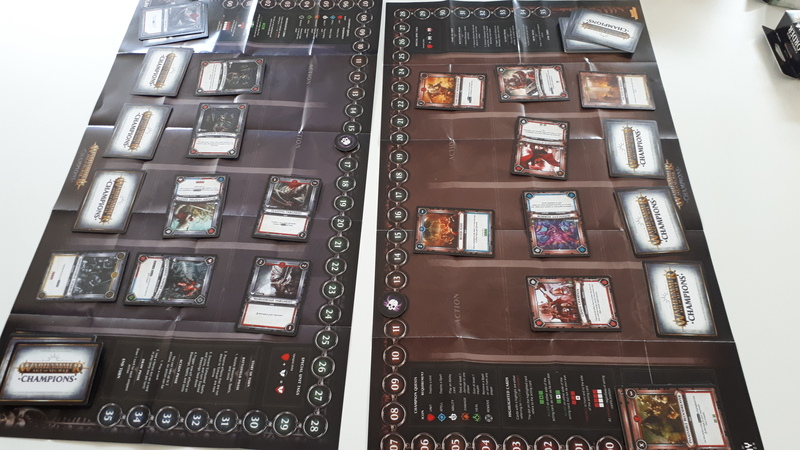 The core premise of the game is fairly simple – two players face off against each other, selecting their choice of the grand alliances (Order, Chaos, Death or Destruction). 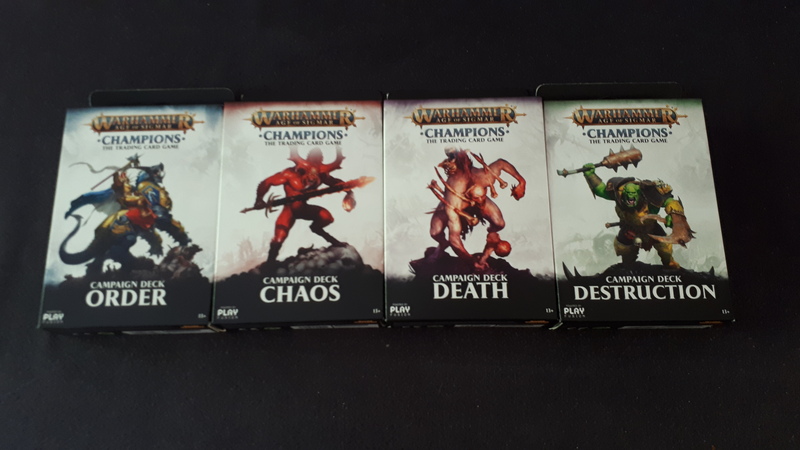 They then deploy four champion cards to act as their army leaders. These champions can deploy unit cards, cast spell or ability cards and activate blessing cards from the gods. The objective of most of these cards is to help deal damage to your opponent. The first player to be reduced to zero hit points loses. Those familiar with Lightseekers will see some similarities here. Laying out the cards on the provided paper mats sees the familiar health counter system, as well as the “order” element from Lightseekers being rehashed as the grand alliances within the Champions game. Whilst there are some similarities they are by no means the same game. Where in Lightseekers players typically seek to deploy powerful combo cards to ensure victory, these do not exist in Champions. The closest thing it has to this are the briefly touched upon “Blessing” cards. These provide incredibly powerful attacks, bonuses for your champions or debuffs to your opponent such as causing all units deployed by your foe to be dormant, or passively dealing damage to your opponent. The method of unlocking these blessing cards is what truly sells the game to me. Each champion has quests to complete in stages which often involve deploying units, casting spells, dealing damage and other criteria. This keeps the game on its toes from being a simple “chip away at their health until they are dead” and provides a strong sense of risk. Do you throw down a card that’ll do serious damage in three turns? Or do you deploy a unit to help one of your champions shuffle one step closer on their quest? The blessings themselves often pay off in dividens but I’ve found that you need to assess the situation and determine whether it’s worth the risk than blindly going for it each time. Playing the game for the first time had me feeling a little out of my depth for someone who doesn’t often play card games. After my second game I felt much more confident and following my third game it began to flow with ease. I’d certainly say that after a couple of introduction runs within Warhammer: Champions the game flows fluidly and you can find yourself finishing a game within around twenty minutes. Deck building, from what I’ve found, is likely to provide kindle excitement to players eager to nail down their preferred style of play. The four different alliances from which you build your decks do feel somewhat different enough to permit varied play-styles. However, it’s a little disappointing not to see more of the sub-factions from such an expansive universe. I suspect we’ll see more in future waves in time. I myself am intent on building a deck for Death focused solely on “Risen”, focusing on resurrecting dead units from the discard pile. The starter decks are a little lacking in units of Risen, therefore, I’ll need to crack open some booster packs. Booster packs aren’t anything new or different in card collecting games. They’re a core part of it. Whilst I sit here anxiously opening booster packs of random cards hoping to get more of the cards I want, I can’t help but worry how much money I’ll sink into the game. My card hunger will grind to a halt either when I’m happy with what I have or simply hit my spending limit. It’s something that, in video games, is typically heralded with mass-criticism, especially in recent days with lootbox controversy. But in tabletop card games it’s an all too-common and accepted way of life. That’s simply an observation that tickles my thoughts, is all. Looping back to the game itself, I can vouch for the fun factor of it. There’s a real sense of strategy and tactics whilst giving you the option to build as comprehensive a deck as you’d like. In the games I’ve played I’ve seen some astonishing comebacks which I always love to see in competitive games. Whilst I’m not strictly a competitive player in many games myself, I believe that Champions has the strength behind it to be a big-hitter on the scene. If Lightseekers is anything to go by, we’ll see a major surge in about 18 months time, especially with Games Workshop to lean on. In terms of the quality of the product, it’s near faultless. The cards are sturdy and adorned in wonderful, licensed artwork. Having a game that looks as good as it plays is not small feat yet Warhammer: Champions accomplishes this in spades. I’ll draw particular notice to the Founders pack on offer during pre-order. It comes beautifully packaged and crammed full of high quality tokens, mats and more albeit at a hefty price tag. It feels as though Warhammer: Champions has stomped into the CCG scene confidently and with bravado. I have no question it will land a strong impact there. My real question, however, is will it hit a chord with the core Warhammer tabletop audience? It’s quite the departure from Age of Sigmar and miniature wargaming as a whole. There may not be the full level of creativity and individuality that the miniatures game offers but there may be enough here to attract folks in for a taste. I reckon a couple of booster packs in will have people determine whether it’s for them or not. I can say that it’s got me by throat, and I’m unsure when I’ll be able to wrestle myself free. If you’re a fan of Age of Sigmar and are willing to try it in all of its forms then I’d certainly advise trying Warhammer: Champions. It has a strong pedigree behind it and as a CCG it’s a doubtless solid entry into the realm. Whether it’ll have people putting down the dice and switching to card sleeving is a question I cannot currently answer. However, if Shadespire is anything to go by I’d say you can expect to see Warhammer :Champions in your local clubs en mass in little to no time at all. Saying that, this game definitely feels like a grower. I’m excited to see where it is this time next year. Be sure to keep checking back for more on Warhammer: Champions as well as other games. As always, to be kept fully up to date you can find us on Facebook.